He was hotly tipped to win, despite a very competitive field at the Pontefract racecourse. A group of 4 high class athletes broke clear. The pace was too hot at the end of the first lap for 800m and 1500m track specialist Ethan Hussey, leaving 3 athletes to battle it out over the next 2 mile. Sam was always in control and with a mile to go he pushed clear of England international Josh Dickinson, and Matt Mackay, a GB fell running international. He cruised the final 400m to win by 13 secs from Josh, with Matt 7 seconds further back. As Sam crossed the finishing line he pointed to the sky and dedicated his win to Robbie Livermore, who was a huge inspiration to all our athletes. 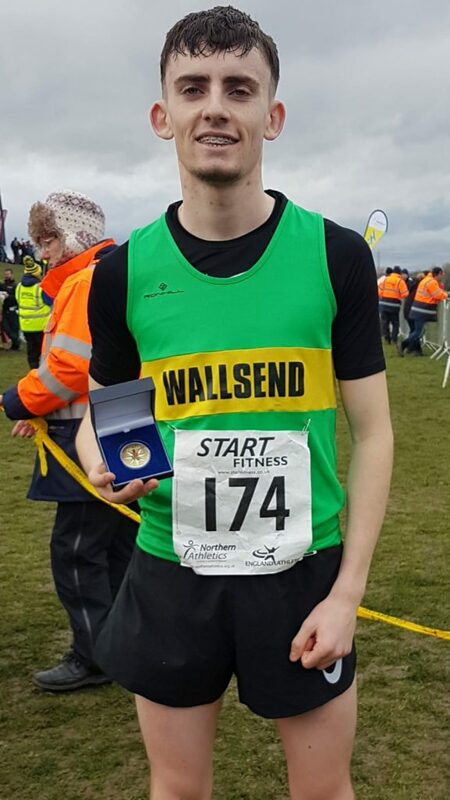 It was fantastic to see Sam and the Wallsend colours at the top of the podium for Northern Athletics, another step forward in his athletics career. Sam was joined by Jordan Middlemist who had a great run in the senior mens race finishing 83rd showing that he is coming into form at the right time to help our men finish the cross country season in style. The next race for young Sam will be the National Championships at Harewood House in Leeds, along with 25 of his Green and Gold teammates. This will be a huge test for us as the Southern and Midland athletes travel to the North.